Santa isn’t the only one hard at work this winter. At the McGowan Histology Core we are cutting frozen sections and offering 25% off your entire frozen project bill. We offer a high degree of technical expertise and can accommodate even the most specialized service needs. You will receive 25% off all of your frozen section needs in December when you mention this ad. Figure 1. The fold change of early and late apoptotic cells with pepsin-solubilized urinary bladder matrix (UBM) or esophageal mucosa (eECM) treatment compared to pepsin negative control is shown for normal Het-1A (A), cancer pre-cursor Barrett’s CP-A (B), and two types of esophageal adenocarcinoma OE33 (C) and SK-GT-4 (D) esophageal epithelial cell lines. Early/late apoptosis was determined using Propidium Iodide/Annexin V staining. The incidence of esophageal adenocarcinoma (EAC) is increasing at a faster rate than any other cancer type in the United States . The standard of care is esophagectomy, a procedure with a mortality rate of 1-18% [2-5] and complication rate as high as 64% . In 2011, the Badylak laboratory showed that long segment mucosal resection of EAC confined to the mucosa (i.e., stage T1a) followed by placement with an extracellular matrix (ECM) bioscaffold was shown to minimize or prevent subsequent stricture, promote the replacement of a functional esophageal mucosa, and perhaps most importantly, was not associated with recurrence of EAC in 5 patients . Since the 2011 report, 9 additional patients have been treated with similar results (unreported data).The ECM scaffolds had completely degraded within two weeks of placement, showing the bioinductive cues of the extracellular matrix changed the default esophageal healing response in an area of resected cancer. The inductive cues ECM provides to direct cell behavior may be explained by the concept of “dynamic reciprocity,” the bidirectional crosstalk between a cell and its surrounding matrix to dictate cell behavior. Hence, the rationale for ECM as a material post cancer-resection is that restoring normal microenvironmental cues by supplying “normal” ECM to the site of resected cancer may provide an early inductive cue and reprogram the cells toward normalcy. The objective of the present study was to expose pepsin-solubilized degradation products of the extracellular matrix to normal, Barrett’s metaplastic cells (the esophageal precursor cancer state), and EAC cells, and then determine changes in cell phenotype, functions associated with tumorigenesis, and cancer signaling pathways. Two types of ECM were used, homologous urinary bladder matrix (UBM) and heterologous esophageal mucosa ECM (eECM). It was hypothesized the ECM would downregulate key neoplastic functions and cancer cell signaling pathways, and that eECM would provide a more pronounced effect to modulate EAC behavior as the homologous ECM source. One of the cell functions investigated was the degree of early and late apoptosis. This study was conducted in collaboration with Lynda Guzik at the McGowan Flow Cytometry Core. Resistance to apoptosis is a hallmark of neoplastic cells . Normal (Het-1A), Barrett’s (CP-A) and EAC (OE33 and SK-GT-4) cell lines were exposed to pepsin-solubilized UBM, eECM, and pepsin negative control for 24h and then evaluated using flow cytometry with Annexin V/Propidium Iodide (PI) staining. 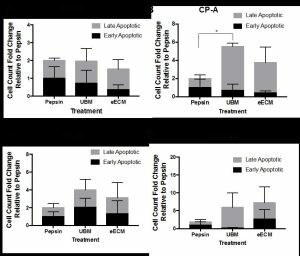 Results showed the metaplastic (CP-A) cells increased late apoptosis compared to pepsin control. No other significant differences were found, however, trends toward increased early/late apoptosis for OE33 and SK-GT-4 cancer cells with UBM and eECM treatment were noted. We are grateful for Ms. Guzik’s expertise in 1) developing the experimental design and optimization of experimental conditions; 2) the performance of the experiment while accommodating our schedule; and 3) her help with the analyses of results. We look forward to collaborating with the flow cytometry core in future studies. Pohl, H. and H.G. Welch, The role of overdiagnosis and reclassification in the marked increase of esophageal adenocarcinoma incidence. J Natl Cancer Inst, 2005. 97(2): p. 142-6. Luketich, J.D., et al., Minimally invasive esophagectomy: outcomes in 222 patients. Ann Surg, 2003. 238(4): p. 486-94; discussion 494-5. Atkins, B.Z., et al., Reducing hospital morbidity and mortality following esophagectomy. Ann Thorac Surg, 2004. 78(4): p. 1170-6; discussion 1170-6. Swisher, S.G., et al., Effect of operative volume on morbidity, mortality, and hospital use after esophagectomy for cancer. J Thorac Cardiovasc Surg, 2000. 119(6): p. 1126-32. Metzger, R., et al., High volume centers for esophagectomy: what is the number needed to achieve low postoperative mortality? Dis Esophagus, 2004. 17(4): p. 310-4. Badylak, S.F., et al., Esophageal preservation in five male patients after endoscopic inner-layer circumferential resection in the setting of superficial cancer: a regenerative medicine approach with a biologic scaffold. Tissue Eng Part A, 2011. 17(11-12): p. 1643-50. The program chair for the 2018 McGowan Institute Scientific Retreat is Julie Phillippi, PhD. Stay tuned for additional details and registration information. Objective: To provide national and regional students with a week-long didactic and experiential learning experience addressing the science and engineering related to the multidisciplinary field of regenerative medicine. Target Audience: Undergraduates, enrolled in a science or engineering program that will have completed their 3rd year of study; exceptional candidates who will have completed their 2nd year of undergraduate study will be considered. Students who are interested in summer internships in addition to the summer school should apply by January 31, 2018. In 1992, the McGowan Center for Artificial Organ Development was formed in a small cluster of research laboratories on the 8th floor of Presbyterian University Hospital. The Center was made possible by the donation of $1 million by Mr. and Mrs. William McGowan. Mr. McGowan was the founding CEO of MCI Communications, and had come to Pittsburgh for a heart transplant. In 2001, the University in collaboration with UPMC expanded the scope of the center to that of an institute, where in addition to medical device development, tissue engineering and cell-based therapies were integrated. The expanded enterprise is today’s McGowan Institute for Regenerative Medicine. This multidisciplinary network, now with over 240 affiliated faculty members from 31 academic departments, has pursued an ambitious program focused on its mission to develop technologies that address tissue and organ insufficiency. Central to this mission is the commitment to expedite the translation of emerging technologies into clinically available products and procedures. In addition to the pioneering science, McGowan affiliated faculty-developed technologies have resulted in 26 spin-out companies. The research areas pursued today by Institute members are dynamic and growing, as the Institute seamlessly integrates engineers, clinicians and basic scientists to fulfill its mission. 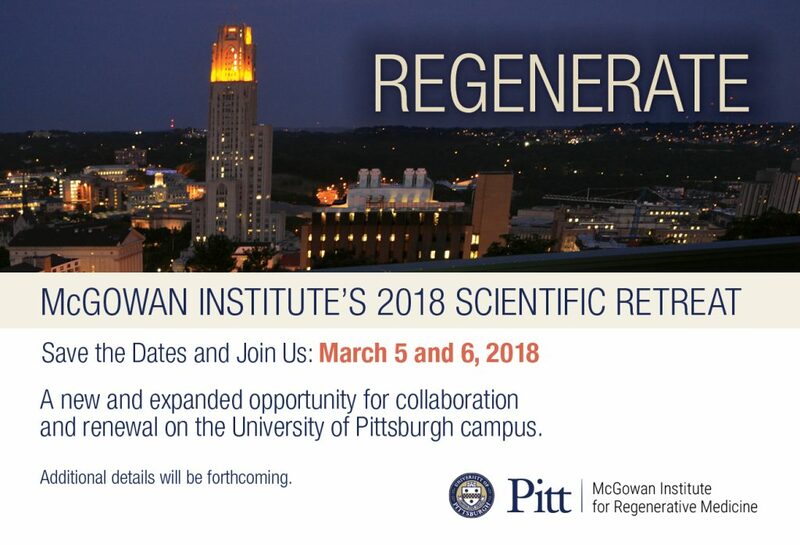 The McGowan Institute has been at the forefront of many advances in the science of regenerative medicine, and in the translation of these emerging technologies to commercial and clinical use. 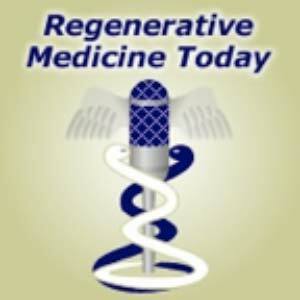 The future for regenerative medicine-based technologies and procedures is bright. Many new devices and procedures are maturing. The basic science programs that support the translational aspects of the program are dynamic and growing. Regenerative medicine offers to be one of the emerging tools to help improve the quality of life and minimize the overall costs of health care. 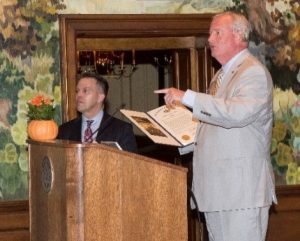 Representative John Maher, Pitt Board of Trustees member, recently presented to Dr. Wagner, Institute Director, a citation from the Commonwealth of Pennsylvania recognizing the 25th anniversary of the Institute and the achievements that have been realized by McGowan affiliated faculty, and their staffs and trainees. MIT Technology Review’s associate editor for biomedicine, Emily Mullin, MA, reported on Dr. Schwartz’s presentation. She reports that for decades, brain-computer interfaces have been imagined as a way for people who are paralyzed or those who have lost arms to be able to do everyday tasks like brushing their hair or clicking a TV remote—just by thinking about it. Such robotic devices exist today—so far, a handful of patients in research labs around the world have tried them, giving them a limited range of motions. Some of the patients treated by Dr. Schwartz and his collaborators include Tim Hemes, Jan Scheuermann, Nathan Copeland (photos of all here). But researchers are still years away from making these devices practical for use in people’s homes, says Dr. Schwartz. Today’s brain-computer interfaces involve electrodes or chips that are placed in or on the brain and communicate with an external computer. These electrodes collect brain signals and then send them to the computer, where special software analyzes them and translates them into commands. These commands are relayed to a machine, like a robotic arm, that carries out the desired action. The embedded chips, which are about the size of a pea, attach to so-called pedestals that sit on top of the patient’s head and connect to a computer via a cable. The robotic limb also attaches to the computer. This clunky set-up means patients can’t yet use these interfaces in their homes. 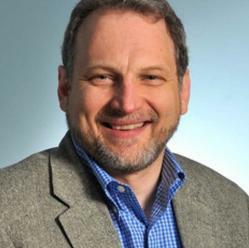 To get there, Dr. Schwartz said, researchers need to size down the computer so it’s portable, build a robotic arm that can attach to a wheelchair, and make the entire interface wireless so that the heavy pedestals can be removed from a person’s head. Dr. Schwartz said he hopes paralyzed patients will someday be able to use these interfaces to control all sorts of objects beyond just a robotic arm. “Just imagine someone using telemetry going into a smart home and being able to operate all these devices merely by thinking about them,” he said. Dr. Schwartz said he’s working on such a model with Draper Laboratory, based in Cambridge, MA, but hasn’t been able to get funding to move the project along. “This is very much on the outskirts of science,” said Dr. Schwartz. EmTech is an annual opportunity to discover future trends and to understand the technologies that will drive the new global economy. It’s where tech, business, and culture converge, and where you gain access to the most innovative people and companies in the world. The 17th annual EmTech examined this year’s most significant news on emerging technologies. 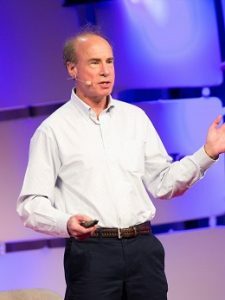 MIT Technology Review events consistently attract senior-level business and technology decision makers who drive the global innovation economy. Illustration: Justin Saglio, MIT Technology Review. Bioengineers at the University of Pittsburgh have developed a new method of using synthetic DNA called “aptamers” to view the effect of cocaine on the brain in real-time with a much higher resolution than other techniques. The Royal Society of Chemistry published their results in its Journal of Materials Chemistry B earlier this year (DOI: 10.1039/C7TB00095B). “Aptamer-based cocaine sensors have been previously developed for detecting cocaine in whole blood samples, outside of the body. We are the first to develop a sensor for detecting cocaine in the brain tissue of live animals,” says Xinyan Tracy Cui, PhD, William Kepler Whiteford Professor of Bioengineering at Pitt’s Swanson School of Engineering and a McGowan Institute for Regenerative Medicine faculty member. 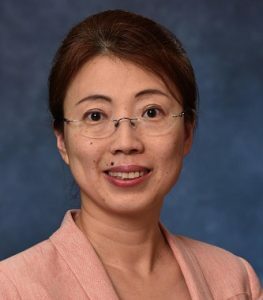 Dr. Cui is principal investigator for a 2-year, $421,185 new study titled “Dual Polymer Coatings for High Fidelity and Stable In Vivo Cocaine Sensing from MEAs.” She and her team will be using the aptamer-based sensors to observe the effects of cocaine use on both adult and adolescent rats and record the differences. In addition to observing the effect of cocaine on the brain, the researchers will be testing a polymer coating that protects the sensors from harmful exposure once they are implanted inside the rats. Past studies have shown that the brain’s biological environment can interfere with the sensors’ ability to relay information to the researchers. Dr. Cui aims to directly measure real-time cocaine concentration in different locations of the brain with micrometer resolution for at least 72 hours. Conventional methods of measuring cocaine in the brain tissue are only able to measure concentration levels every 5-10 minutes and over a large volume. “Our sensor technology platform is well suited to be developed for detecting other substances in the future,” assures Dr. Cui. From the smallest cell to humans, most organisms can sense their local population density and change behavior in crowded environments. For bacteria and social insects, this behavior is referred to as “quorum sensing.” Researchers at the University of Pittsburgh’s Swanson School of Engineering have utilized computational modeling to mimic such quorum sensing behavior in synthetic materials, which could lead to devices with the ability for self-recognition and self-regulation. The findings are based on research into biomimetic synthetic materials by McGowan Institute for Regenerative Medicine affiliated faculty member Anna Balazs, PhD, John A. Swanson Chair in Engineering and the Distinguished Professor of Chemical and Petroleum Engineering, and post-doctoral associate Henry Shum, PhD, who is now an assistant professor of applied mathematics at the University of Waterloo. 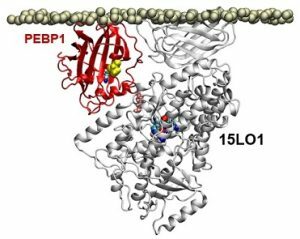 The article, “Synthetic quorum sensing in model microcapsule colonies,” is published in the journal PNAS. Illustration: Modeled microcapsules (image: grey spheres/gif: small circles) demonstrate “quorum sensing” behavior. University of Pittsburgh Swanson School of Engineering. When Michael Wells had an idea for a healthcare startup when he was a University of Pittsburgh student, he didn’t know where to go for help within the University to move it forward. For the past seven years, the successful healthcare investor and entrepreneur has helped accelerate the culture of innovation and entrepreneurship at Pitt through the Michael G. Wells Competition to ensure that any student with such an idea has access to resources and support to take it all the way. Also, Laurie Kuzneski, together with her husband Andy, created the Kuzneski Innovation Cup. In its second year, the competition assists Pitt innovators with non-healthcare ideas. Both competitions’ judges agreed that choosing this year’s winners was very difficult due to the quality of all the nominees’ presentations. The top prize of $20,000 for the Wells Competition went to Esophagel, which is developing an extracellular matrix hydrogel that can be delivered to the esophagus to control inflammation and promote tissue remodeling in patient’s suffering from Barrett’s esophagus. 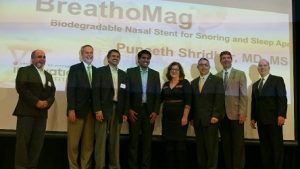 The team was previously a winner of the Pitt Innovation Challenge (PInCh) competition and is led by postdoctoral fellow Juan Diego Naranjo, PhD, and PhD candidate Lindsey Saldin. 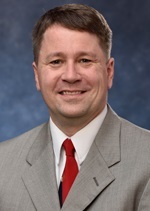 The technology is from the lab of Stephen Badylak, DVM, PhD, MD, deputy director of the McGowan Institute for Regenerative Medicine, who holds over 60 U.S. patents. In the Kuzneski Innovation Cup competition, the top prize of $15,000 went to PneuMobility, out of Pitt’s Human Engineering Research Lab, led by McGowan Institute affiliated faculty member Rory Cooper, PhD. They have developed PneuChair, a wheelchair powered with compressed air that is lighter than electric-powered chairs and is waterproof. Four of the chairs were built for Morgan’s Wonderland, a theme park for the disabled in Texas that includes a water park. The student innovator, PhD candidate Brandon Daveler, said there is significant investor interest in the PneuChair. “Seeing the impact that this innovation has already made, seeing the smiles on the kids’ faces who couldn’t previously enjoy a water park on their own, makes us even more determined to reach more people,” Mr. Daveler said. 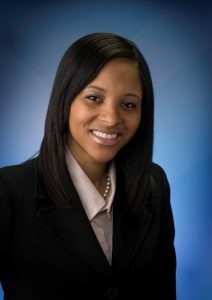 #177 –– Dr. Rachelle Palchesko is the Special Faculty Researcher in the Department of Biomedical Engineering at Carnegie Mellon University. Dr. Palchesko discusses her research on the regeneration of the corneal endothelium. Summary: AKI carries a significant mortality and morbidity risk. Use of a clinical decision support system (CDSS) might improve outcomes. We conducted a multicenter, sequential period analysis of 528,108 patients without ESRD before admission, from October of 2012 to September of 2015, to determine whether use of a CDSS reduces hospital length of stay and in-hospital mortality for patients with AKI. We compared patients treated 12 months before (181,696) and 24 months after (346,412) implementation of the CDSS. Coprimary outcomes were hospital mortality and length of stay adjusted by demographics and comorbidities. AKI was diagnosed in 64,512 patients (12.2%). Crude mortality rate fell from 10.2% before to 9.4% after CDSS implementation (odds ratio, 0.91; 95% confidence interval [95% CI], 0.86 to 0.96; P=0.001) for patients with AKI but did not change in patients without AKI (from 1.5% to 1.4%). Mean hospital duration decreased from 9.3 to 9.0 days (P<0.001) for patients with AKI, with no change for patients without AKI. In multivariate mixed-effects models, the adjusted odds ratio (95% CI) was 0.76 (0.70 to 0.83) for mortality and 0.66 (0.61 to 0.72) for dialysis (P<0.001). Change in adjusted hospital length of stay was also significant (incidence rate ratio, 0.91; 95% CI, 0.89 to 0.92), decreasing from 7.2 to 6.0 days for patients with AKI. Results were robust to sensitivity analyses and were sustained for the duration of follow-up. Hence, implementation of a CDSS for AKI resulted in a small but sustained decrease in hospital mortality, dialysis use, and length of stay. Description: In the United States, there is a critical shortage of organs for transplant, with only a quarter of the 120,000 patients in need of an organ actually receiving one. The cost of patients awaiting transplant to the healthcare system totals tens of billions of dollars each year. Meanwhile, thousands of organs are discarded each year as a result of injury from inadequate blood flow (ischemic injury) as the donor is dying. The traditional paradigm for consented Donation after Cardiac Death donors has been to discontinue cardiopulmonary life support, leaving organs without adequate blood perfusion until the heart stops. This contrasts with the usual end of life care options for patients who are not donors, in which patients and their families can elect to withhold life support for some body functions (CPR, agents to maintain blood pressure, dialysis, or intubation) while at the same time maintaining life support for other organs. Our proposal details an innovative needlestick approach to maintain selective blood flow to the organs while allowing the donor heart to fail on its own terms. This contrasts to previously reported approaches which would accelerate cardiac death, against ethical principles. We have examined a commercial hybrid prototype Organ Perfusion Stent (OPS) in a pilot study and shown improved blood delivery to organs without a negative impact on cardiac function. Recognizing the logistical challenges of current imaging for device placement in a critically ill patient, such as a donor, we have also developed a portable radiofrequency (RF) approach for stent positioning at bedside. The primary objective of the current approach is to demonstrate that a novel custom made OPS provides objective protection against ischemic organ injury. Our investigation will begin with optimizing the mechanical properties of this novel dual-chambered stent to ensure rapid deployment, successful isolation of the visceral arteries, and simplified retrieval. Next, we will optimize the hemodynamics of the stent to ensure uniform blood flow to the organs. A miniaturized RF antenna will then be directly printed onto the stent structure. In a porcine model of the organ donor, an OPS will be deployed by a needlestick access while under close cardiac monitoring. Positioning approaches using both portable X-ray and RF tag approaches will be compared to gold standard angiography for device positioning. Following a 60 minute period of simulated malperfusion with interval biopsies, both stented and control animals will be recovered with daily assessment to monitor organ function. At two days postoperatively, liver, pancreas and kidney biopsies will be evaluated for ischemic changes histologically. To investigate this device in a human context, an OPS calibrated for human anatomy will then be evaluated for successful deployment and organ perfusion in a heart beating human cadaver model. In summary, we expect that ultimately, an Organ Perfusion Stent may allow every consented donor to successfully donate organs for transplant while respecting the ethics of organ recovery.